Undefeated Cleveland Super Bantamweight contender Antonio “Carita” Nieves (10-0, 5 KO’s) returns to the ring for the first time in 2015 this Saturday, March 28th at the Resorts World Casino in Queens, New York. Nieves is headlining the card as the Main Event against Saul Tejada (5-3-2, 1 KO) of Spain. Nieves made his mark in Cleveland as amateur. He was a five-time Cleveland Golden Gloves champion while also being ranked in the top 10 by USA Boxing. The eight round main event will be a first for Nieves, whose last four bouts have been scheduled for 6 rounds. If the fight does go the distance, Nieves is sure there won’t be any concern regarding fatigue. This will also be Nieves’ first fight in New York, but taking a road trip will be nothing new for the 27 year old. He’s already fought in Puerto Rico, Pennsylvania, and West Virginia in addition to his Ohio fights. Nieves knows the lights will be shining bright in the Big Apple. “To have my first main event fight in New York is a big opportunity and I will take full advantage of it and shine. Being the main event fighter is exciting. 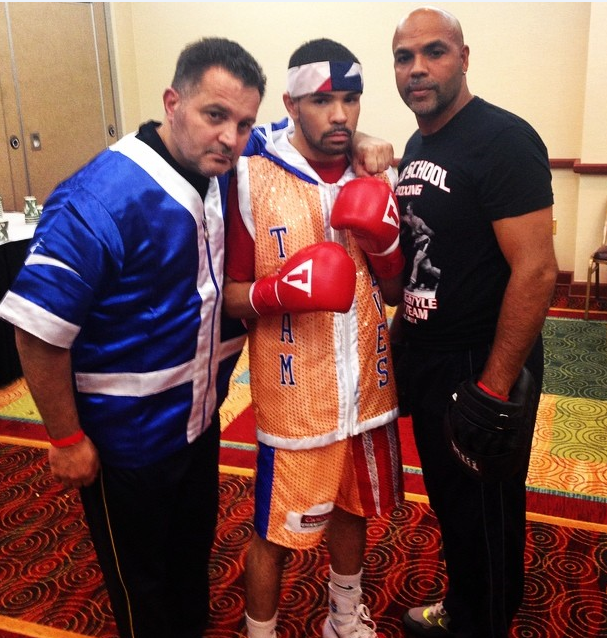 I’m ready to put on a show and showcase my talent,” proclaimed the confident Nieves. Coming off a busy 2014 that saw him fight five times, Nieves won three of those by knockout. In his last fight against DeWayne Wisdom, he scored four knockdowns en route to a fifth round stoppage at Wheeling Island Casino in West Virginia on December 20th. With a three month layoff between fights, Nieves has been able to work on improving his already solid technique. He trains under the tutelage of Francis Figueroa and Joe Delguyd at the Old School Boxing Club located inside Strongstyle Mixed Martial Arts and Fitness Center. “Since my last fight we’ve been focusing on a couple of things. We’ve been focusing on establishing my jab more, defense, and using more angles. I have a great jab but tend to under use it at times,” Nieves confessed. Nieves wrapped up his heavy training for the fight over the weekend and is now just doing light work to stay on weight, which is contracted at the Super Bantamweight limit of 122 pounds. This will be the first fight in America for the lesser known Tejada, whose previous fights have all come in Europe, including all but one in Spain. “I don’t know much about him. I’ve seen some tape on him, but that’s about it,” stated Nieves. Tejada is unbeaten in three of his last four fights including his last two. He’s coming off a four round unanimous decision victory in his last bout on February 21st. Nieves will waste little time after this bout as he’s already scheduled to fight in Puerto Rico on the undercard of the Orlando Salido vs Roman Martinez Super Featherweight title fight on April 11th. THAT’S MY BROTHER I LOVE HIM SO MUCH,I KNOW U CAN DO THIS,AN GOD WILL ALWAYS BE AT UR SIDE AND UR FAMILY TOO.GO CARITA NIEVE U GOT THIS….